If you've found your way here after cutting out a spectrometer from the Economist, welcome! 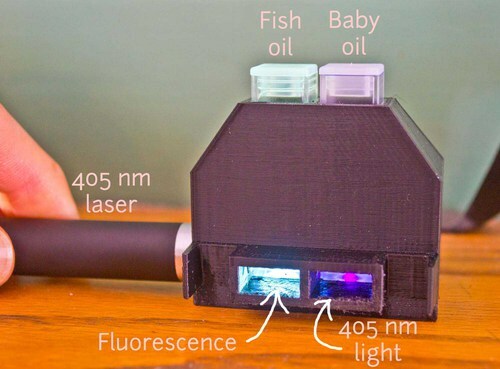 This introductory kit (also available here, and more info here) has been co-designed by hundreds of contributors as an entry point to Public Lab's collection of Do-It-Yourself spectrometry projects. It's not the most robust design, or the most precise. But it's specifically for newcomers to get started on -- a stepping stone on the way to bigger and better DIY designs like the Desktop Spectrometry Starter Kit and many more. This broader initiative is still actively under development by thousands of people coordinating their work across the open Public Lab community! Read more about our challenges we're tackling, as well as the limitations and goals of our designs. Once you've assembled it (a task in itself!) and noted any ideas for improving it, take the next step by looking at a more advanced activity below. If you're looking for a more robust design, try our new Lego Spectrometer. Then circle back to the activities listed below. We're especially interested in people pitching in to test out a new method for determining the concentration of a water sample. We'd deeply appreciate your help in testing it out and troubleshooting! Click here to try comparing water samples -- but be sure to assemble and calibrate your spectrometer first! This activity is not complete -- we need your help to flesh it out, troubleshoot it, and refine it so it's both rigorous and easy to do. If you're not sure how to help, the first step is to ask some questions below! Anyone may join in -- to take the first step, find a question or project you're interested in, and share your thoughts! How can you help? The first thing we're looking for help with is refining this new version of the foldable spectrometer design. We're hoping it'll be stronger, easier, and more intuitive to use than its predecessor, as well as easier to duplicate (you can just copy it onto stiff paper with a laser printer/copier). These are more advanced activities for after you've gotten up and running with the starter activities above. The easiest way to get involved is to simply ask questions!